October 1910: Gordon-Bennett Cup This Month... in 1910 British pioneer Claude Grahame-White (left) won the 2nd Gordon-Bennett Cup Race for aeroplanes. The contest took place at Belmont Park, New York on 29 October and was contested by teams from France, USA and Britain. The pilots had to cover a course of 5km 20 times. Flying a Blériot monoplane, Grahame-White averaged 62 mph to complete the course in 1 hr 4 mins. He had fitted a new 100hp engine for the race which created some problems: "...the heat ... made some of the woodwork of the monoplane's body begin to smoulder. I smelt the burning wood as I flew round the course, and saw smoke beginning to blow back," he wrote. "The situation ... was distinctly trying." 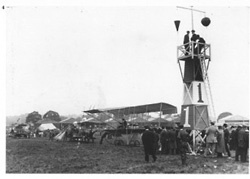 July 1910: Bournemouth Aviation Meeting This Month... in 1910 the Bournemouth International Aviation Meeting took place. Between 11-16 July well-known pilots such as Claude Grahame-White (flying a Farman III), Leon Morane (Blériot XI) and Edmond Audemars (Demoiselle) participated in the various competitions, including a race to the Needles on the Isle of Wight. Morane won many of the prizes, including the speed prize with 56 mph. Sadly Charles Rolls (co-founder of Rolls Royce) was killed on 12 July when his French-built Wright (pictured left) suffered structural failure. A new tailplane he had fitted a few days before broke away as he was pulling out of a steep dive during the spot-landing contest. He was the first Briton to be killed in a flying accident. 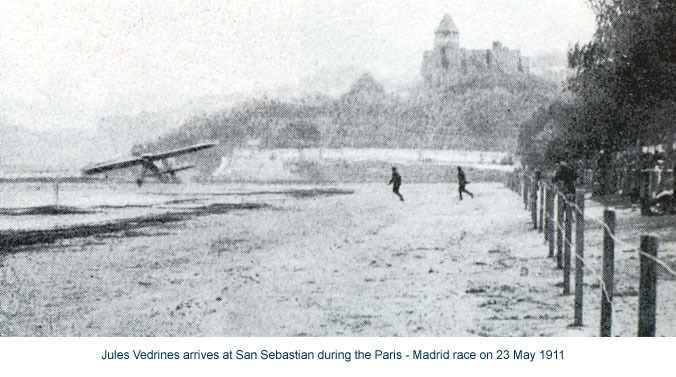 May 1911: the Paris - Madrid race This Month... in 1911 Jules Védrines covered 1197 km (732 miles) to win the Paris - Madrid race flying a 70 hp Morane-Borel. The route took competitors via Angoulême (Dordogne) and San Sebastian (N. Spain). "San Sebastian gave me the impression of a huge spade-cut made in the middle of Mt. Fontarabie," he wrote. "To reach the place to land you had to pass between two mountains which rose up on either side of the pass. And there, right at the bottom, I would find the little beach which served as the landing ground. These mountains ... were black with people. ... I decided to give [the crowd] ... a show.... I was still over the open sea when I cut the ignition. ... A few seconds later, I was busy between the two peaks. I passed really close to one of them ... within stone's throw of the cheering crowd." Védrines went on to win the race on 26 May in a total time of 14 h. 55 m.
April 1912: first woman to fly the Channel This Month... in 1912 Gustav Hamel flew Eleanor Trehawke Davies to Paris, making her the first woman to cross the English Channel by aeroplane. The pair left Hendon (London) at 9:38 a.m. on 2 April in a two-seater Blériot XI (70 hp Gnôme) and crossed the coast at Dover around 11. Unfortunately, Miss Trehawke Davies failed in her task to ensure the pressure in the petrol system was kept up and the engine stopped in mid-Channel. Luckily Hamel had enough height to glide to a safe landing in a field at Ambleteuse, near Cap Gris Nez. After a further stop on the beach near Boulogne to keep their lunch appointment with Louis Blériot the couple set course for Paris and arrived safely at Issy-les-Moulineaux at 5.55 p.m.
March 1911: Hendon - Brooklands This Month... in 1911 the owners of Hendon and Brooklands put up a prize for the fastest return flight between the two London aerodromes. Four pilots attempted the task on 11 March. First off was Clement Gresswell (Blériot XI), but he was forced down by fog near Staines. Next J. V. Martin (G. W. 'Baby') made it to Brooklands, but became hopelessly lost on the return leg, landing at St. Albans 15 miles away before finding Hendon again. 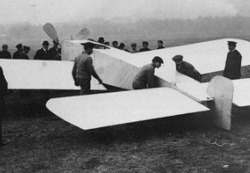 Maurice Ducrocq (Farman III) was forced to turn back to Brooklands at Kew by fog. 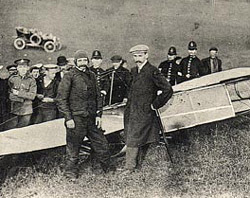 Only Gustav Hamel (Blériot XI) (left) was able to find his way without problems, picking up the prize and making the 40 mile double trip in 49 mins 35 secs. December 1912: a winter flight! This Month... in 1912 Pierre Verrier (pilot) and Lt. Gilbert Mapplebeck (passenger) undertook an adventurous winter flight from Hendon to Brooklands. Although the distance between the two London aerodromes was only 20 miles, the flight was made in the teeth of a 45 mph south-westerly gale. Since their Maurice Farman MF.7 "Longhorn" (70 hp Renault) had a top speed of 55 mph, this meant the flight took 2 hr. 10 mins, giving an average ground speed of 9 mph! Clement Gresswell, following them in a car, was forced to stop several times to allow the aeroplane to catch up. Many thanks to Joe Gertler for allowing me to use Charles Hubbell's beautiful watercolour of Verrier's MF.7: see http://www.memaerobilia.com/hubbellwater.asp for more. November 1907: the Bleriot VII This Month... in 1907 experimenter Louis Blériot flew his seventh design of aircraft in 'hops' of 500 metres at Issy near Paris. Despite the short distances covered, the 50 hp Antoinette-powered Blériot VII was to be of fundamental importance to the history of aviation. For the first time it brought together a monoplane layout with a tractor propeller, a fully enclosed fuselage and internally braced wings: a configuration that would be used in thousands of aircraft up to the present day. In the short term the VII was wrecked in landing on 18 December, but from it Blériot went on to develop his Channel-crossing Type XI of 1909. 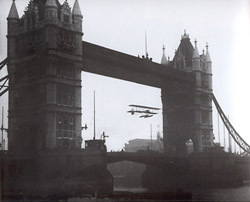 August 1912: through Tower Bridge This Month... in 1912 Frank McClean piloted a Short S.33 sea plane through Tower Bridge and then underneath every other bridge to Westminster. McClean left the Isle of Sheppey in the Thames Estuary at 6:30 a.m., on 10 August, and came down below 150 ft. near London in order to be out of the smoke from the factory chimneys. Reaching Tower Bridge at 7:50, he 'bounced' his floats going under Blackfriars railway bridge to loud cheers from spectators, and almost grazed his wingtips under Waterloo Bridge. 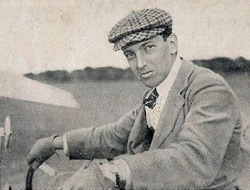 Although prevented by the police from repeating the feat on his return journey, McClean had achieved his aim of beating French pilot André Beaumont in making the first 'hydro-aeroplane' flight to London. In 1914 McClean moved up a notch - flying up the Nile to Khartoum. June 1912: Circuit d'Anjou This Month... in 1912 young pilot Roland Garros battled through the elements to win the French Aero-Club's Prix d'Anjou. The race had started on 16 June as the annual Grand Prix de l'Aéro-Club de France over a 190 km (120 mi.) triangular course Angers - Cholet - Saumur, but conditions were so severe that overnight the rules had to be changed and the race shortened in the interests of safety. Of the six starters (who included Gustav Hamel), only two completed the first day's flying. Garros had taken off in a 43 mph (72 kmh) gale, flown through a downpour and been engulfed by a hail storm. Each lap of the course took him about 2.5 hours to complete. "[The] third lap was a sweet relaxation compared to the first two," he recalled. His machine was a lightened 50 hp Gnôme Blériot XI, which was supervised in the field by a team of mechanics led by Louis Blériot in person. On the second day, the weather was kinder and Garros was able to complete a further four laps to claim the 75,000 franc prize. He also cemented his reputation as an excellent pilot and impressed the military with the Blériot's ability to fly in any weather with a heavy load of petrol. May 1911: Brooklands - Brighton This Month... in 1911 the first race between Brooklands and Brighton took place, for a prize of £80. On 6 May, Graham Gilmour (flying a Bristol Boxkite) took off, followed by Lt. Snowden-Smith (Farman biplane), Howard Pixton (Avro biplane) and Gustav Hamel (Blériot XI) according to a handicap system devised in advance. The race from London to the south coast was easily won by Hamel who reached the finishing post at the Palace Pier in 57 min. 10 secs. Gilmour came second, taking 1 hr. 37 mins. to cover the 40 miles (a ground speed of 25 mph). Snowden-Smith was disqualified for missing the turning point at Shoreham, and Pixton finished last after getting lost and landing at Plumpton to ask the way. April 1875: The Zenith Tragedy This Month... in 1875 an early balloon ascent was made above 25,000 ft. with sadly fatal results. 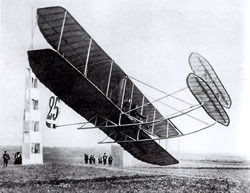 The Zenith took off from Paris on 15 April 1875 piloted by Théodore Sivel, assisted by Jospeh Crocé-Spinelli and Gaston Tissandier. 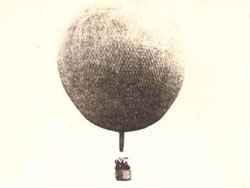 The balloon rose to an estimated 28,000 ft in an attempt to beat the altitude record set by British aeronauts Henry Coxwell and James Glaisher in 1862. But despite the presence in the Zenith of oxygen apparatus both Sivel and Crocé-Spinelli succumbed to the effects of hypoxia and cold. Only the younger Tissandier returned to earth alive, and the tragedy effectively put an end to this first Victorian phase of engineless high altitude exploration. February 1914: Berliner's balloon record This Month... in 1914 engineer Hans Berliner set a new world distance record for gas balloons of 3,053 km (1,897 miles), which remained unbroken until the 1970s. 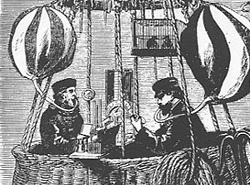 On 8 February he took off from Bitterfeld in Germany, accompanied by Alexander Haase and Arnold Nicolai, in the balloon 'Siemens Schuckert' of 1,680 cu. m. capacity. That night they crossed the Baltic coast, heading for Russia. "Ahead, the lighthouse at Rixhoeft shines ghostly for us, and soon we hear rain showers falling distantly on the sea. At 11 o' clock we leave the mainland and our native coast disappears gradually in the evening mist. Soon we also lose the beacon on the Hela peninsula. Now we are all alone, between water and sky," he wrote. The next day a gale force wind swept the balloon deep into Russia over the Ural Mountains. It finally landed in deep snow near the town of Kirgischan, 150 km west of Jakaterinburg, after 47 hours in the air. Here, the fliers were promptly arrested by Russian secret police as spies and thrown in jail. After 3 months they were able to buy bail for 12,500 gold marks. Berliner returned to Germany in May, where he had been given up for dead; a few weeks later Russia and Germany were embroiled in the 'Great War'. January 1912: naval experiments This Month... in 1912 Sub-Lt. Charles Samson flew a Short S.38 off the fore-deck of HMS Africa. The battleship, fitted with a 100 ft. wooden take off ramp (left), was moored in the River Medway for the experiment. Samson's aircraft had both floats and wheels, enabling it to land on either water or land. On 10 January 1912, Samson successfully flew off from the ship and landed at the nearby Royal Aero Club flying ground at Eastchurch. It was the first time an aeroplane had been launched from a Royal Navy ship. 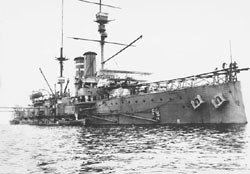 On 9 May, Samson repeated the feat from HMS Hibernia while she was underway. The first landing on a moving vessel, however, did not take place until 1917. Sir, -- Motor-cars are bad enough, but they do not come into one's home or garden. With aeroplanes total strangers may drop in, through the roof, for a little chat at any time. I fear the law cannot protect one against such intrusion. If aviation becomes popular I shall have spikes, with long strong prongs, fixed to the chimneys of my house, and the word "Danger" painted in large red letters on a flat part of the roof. If any flying machines come down in my garden I shall send for the police to remove the occupants, whom I shall sue afterwards for any damage to my trees and shrubs. October 1908: first flight in Britain This Month... in 1908 American Samuel Cody made the first sustained flight in Britain. On 16 October Cody, who had designed and constructed 'British Army Aeroplane No.1', flew it for 1,390 ft. (424 m.) over Farnborough Common. For the historic occassion, Cody had fitted a Union Jack between the tail booms (just visible left). The flight ended in a minor crash when Cody tried to turn the aeroplane to land: "I pulled the steering handle over as hard as I could. Then I faced another bunch of trees right in front of me. Trying to avoid these, I turned the rudder, and it turned rather sharp. The side of the machine struck the ground, and it crumpled up." Cody was unhurt aside from some cuts and bruises. September 1913: birth of the loop This Month... in 1913 Russian army officer Lt. Petr Nesterov became the first man ever to 'loop the loop'. 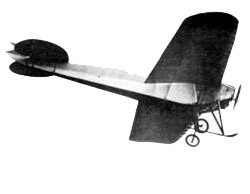 The feat was performed at Kiev on 9 September in a Nieuport monoplane. Nesterov was initially placed under arrest for endangering his machine, but when it became clear he was a hero he was promoted! Without knowledge of Nesterov's feat, the manoeuvre was repeated in France by Adolphe Pégoud on 21 September. He was flying a slightly modified Blériot XI (pictured left) in order to demonstrate its safety. Between 25-27 September Pégoud came to England to demonstrate his skills at Brooklands. The visit generated considerable interest in the 'upside-down airman' and was reported in detail by The Times. It also attracted the attention of The Graphic and historian William Claxton. June 1911: The 'Circuit of Europe' This Month... in 1911 the 'Circuit of Europe', a race of 1710 km over a course Paris - Utrecht - Brussels - Calais - London - Paris took place (programme pictured left.) Forty-two pilots started on 18 June but only 8 finished the arduous course two weeks later. Among these was Roland Garros, flying a Blériot XI. Of the spectacular dawn Channel crossing from Calais he wrote, "Left second, in accordance with the overall ranking, and arrived in Dover first of all, after an excellent crossing - and so I assisted in the first invasion of the untouchable territory of old England by a flying squadron..." As in the Paris-Rome race the previous month, Garros finished second and the contest was won by Jean Conneau. May 1911: Paris to Rome This Month... in 1911 the first Paris - Rome air race took place. The competitors set off on 28 May 1911 via Dijon, Lyon, Avignon, Nice, Genoa, and Pisa on the 910 mile (1465 km) course. Despite being forced to change aeroplanes, Roland Garros (left) led the field most of the way. Jean Conneau of the French Navy also had a difficult race, involving two forced landings and a change of engine. Both pilots flew Blériot XIs. However, when Garros crashed near Pisa Conneau took his chance to come from behind and win the race. He was mobbed when he arrived in Rome on the morning of 31 May, after 28 h, 5 min in the air. André Frey and René Vidart came 3rd and 4th. April 1910: the London to Manchester race This Month... in 1910 Englishman Claude Grahame-White and Frenchman Louis Paulhan competed to win the Daily Mail £10,000 prize for the first flight from London to Manchester. 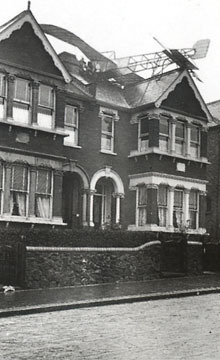 The race, which took place over 27-28 April, included the first night flight in Britain, as the fliers attempted to use every ploy to gain an advantage over the other. Both flew virtually identical Farman III biplanes and received technical assistance from Henry Farman himself. The race generated immense public interest and inspired numerous similar races across Europe in 1911. Feb. 1906/07: C. F. Pollock crosses the Channel This Month... in 1906 and 1907 balloonist C. F. Pollock crossed the English Channel from Britain to continental Europe. Although the winter weather grounded many, it brought the north winds needed to make the flight from England possible. On 3 Feb. 1906 Pollock flew with Mr Dale, a fellow member of the Aero Club, from Wandsworth in a balloon called the Vivienne III to the French coast near Dieppe. The next year, he repeated the performance by piloting The Hon.-Mrs Harbord in her balloon, the Nebia, on 21 Feb. 1907 from Chelsea to Stavelot in Belgium. The 1906 flight took 3 hr. 20 mins. but the 1907 lasted over 10 hrs. On both occasions the voyagers landed in violent snowstorms. Pollock was awarded the Aero Club's silver medal in 1911. Jan. 1908: the first kilometre flight in Europe This Month... in 1908 sportsman Henry Farman won the 50,000F. Archdeacon-Deutsch Prize for the 'first' kilometre circuit in an aeroplane (left). He flew a Voisin. At this time there was still widespread scepticism of the Wright brothers' achievements, and so Farman was hailed a hero following his flight of 13 Jan. 1908. The London Times declared, "to-day has been an epoch making date, that of the victory before official witnesses of human intelligence in its efforts to solve the problem which brought Icarus to grief, [and] which tormented the brain of Leonardo da Vinci...". (Full report) In fact the Wrights had made a similar flight as early as 1904. Dec. 1910: Sopwith wins the de Forest prize This Month... in 1910 young pilot Tommy Sopwith won the £4,000 Baron de Forest Prize for the longest flight before the year's end from England to the Continent. On 18 Dec. 1910 in his Howard-Wright biplane (left) he flew 169 miles (272 km) to Beaumont in Belgium. Although the weather was fine in Kent it was unsettled on the other side of the Channel, as Sopwith later recalled, "Soon I crossed the Belgian frontier and it got so rough I was nearly thrown out, but hung on with one hand under the seat. We had no seat belts in those days; nor did we have such luxuries as an airspeed indicator. The only instruments were a rev. counter which worked, a compass which did not and a barograph ... reading only to 2,000 feet." Sopwith returned by steamer.